Actual size of book - 8-1/2" x 11"
"The U.S. Mint experimented with aluminum in coinage from 1855 through 1975, but it never used it in production for our coinage. For coinage, aluminum has many benefits over other metals, it has a low density making it light, when it is exposed to air it forms a thin layer of oxide that adds a protective layer, greatly improving its resistance to corrosion, and is durable, making it more resilient to wear. Aluminum is the most abundant element in Earth s crust, but is almost always found in combined states with other metals. The evolution in the process of separating aluminum into a pure state is important to the consideration and cost of using aluminum in coinage. Many archive records were uncovered that show why the Mint was testing different metals and the results of the Mint testing with aluminum in coinage. These help us understand why some of the decisions were made. Other archive records provide details on how many patterns were struck in aluminum. For example, up to now, it was believed that only four 1868 aluminum proof sets were struck. Records clearly show that 11 sets were struck. 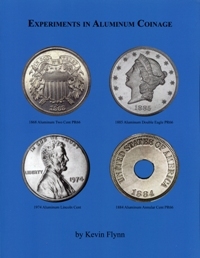 As all aluminum coinage, except for the 1974 aluminum cent, was struck as patterns, this book studies the production of patterns in general during this period on their production and distribution. For example, an important question is why were aluminum patterns struck for denomination for each year between 1868 and 1875. Was the Mint striking to test this alloy or simply striking patterns for sale to collectors, or striking them for Mint personal? This book explores all aspects of the Mint s experimenting with aluminum for coinage."